My name is Rob, and I’m part of the conservation team at Beale Park. One of the things I do is monitor the moth population throughout the season. 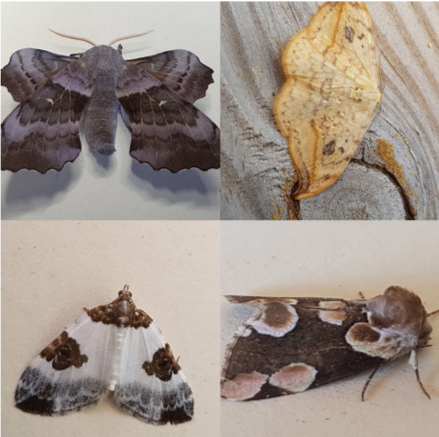 Moths are in the same order of insects as the butterflies, the Lepidoptera, and we have 59 resident butterfly species, whereas there are over 2400 species of moth in the UK. Some moths fly by day but the majority are active at night. They range in size from a few millimetres long to the spectacular Hawk-moths some of which are larger than butterflies, like the Peacock commonly seen on buddleia bushes. Moths are an integral part of the ecosystem pollinating plants and providing food for many other species such as bats. The caterpillars are a vital food and water source for the chicks of many of smaller birds in spring and their breeding success rate is very dependent on the abundance of caterpillars at that time. 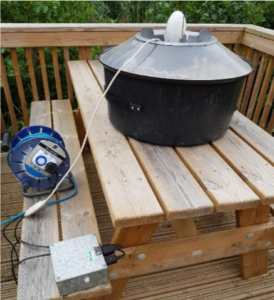 The main method I use to monitor moths is with the Robinson light trap on top of which sits a powerful mercury vapour light. The moths are attracted to this and fall into the trap where they safely hide amongst the empty egg boxes scattered inside. The moths are then recorded prior to the trap being put in a shady place allowing them to fly away in the evening. So far we have recorded over 400 different species at Beale Park, a figure that is still going.